Description: As you grow to own hotels and casinos you'll want to set the amount of floor space given to rooms, bar and restaurant areas, roulette, card tables, slot machines, entertainment lounges, and to also set the level of payouts, profits and cream offs on the tables and machines. You will be able to see, in high detail, which of your outfits are popular. 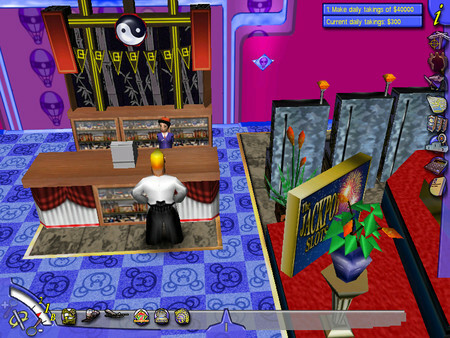 The graphical scale allows you to track the ebb and flow of the city at a zoomed out perspective, but then to zoom inside your buildings to see the gamblers playing Black Jack at the tables. You can actively encourage the growth of the city by your actions. This is a tourist town; it has a multitude of businesses that very visibly attract customers if popular; the airport and roads become busy. The streets get choked. The tills ring more frequently. And, provided you're taking care of business, the profits will roll in. 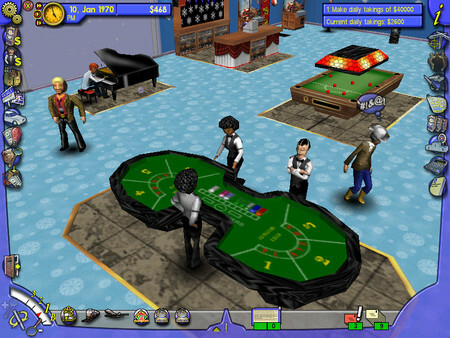 Casino, Inc. features three fictitious cities; Little Hope Springs, Fortune Falls and ChancersvilleThere are over 120 different characters in the gameThere are over 50 attractions you can buy for your CasinosBuild 1 to 5 star hotel accommodationSet up Limos and Shuttle Bus servicesDamage your rivals by starting fights, spiking drinks and shooting people! !Making money has never been so much fun!